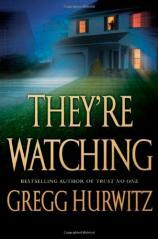 Gregg Hurwitz is one of those people who does a number of things amazingly and enviably well. Quick, let’s trip him. Seriously, Hurwitz has penned an impressive list of thriller novels, scripted screenplays for a who’s who list of producers and studios, and written story arcs for some of the most iconic figures in comic books, including Wolverine and The Punisher. THEY’RE WATCHING, his latest effort, combines action, strong characterization, and a genuine, mesmerizing mystery to produce what is arguably his best and strongest novel to date. Patrick Davis is an interesting character, a Hollywood-style Everyman who achieves his life’s dream for a New York minute before everything turns to sewage. He feels that he is on the road to stardom when he sells his first screenplay, They’re Watching, to a major studio. A next-big-thing actor is slotted for the starring role, and Patrick seems to be on his own personal fast track. But within a heartbeat or two, his life collapses. The actor sues him, the studio fires him from the set, and his relationship with his wife, Ariana, undergoes a major upheaval. Patrick lands a job teaching scriptwriting at a Los Angeles college, but he is not where he wants to be in any phase of his life. Then things get even worse. The entity that has invaded their lives begins giving Patrick errands to run that are the stuff of reality television good deeds. The motivation behind these, though, takes a malevolent turn when he suddenly finds himself on the wrong end of a violent setup. And then the situation deteriorates further. Patrick is a pariah, investigated by the police, hounded by the press, and beset on (almost) all sides. Things get so bad, in fact, that one wonders if Patrick will ever get out of the hole that someone seems to be digging just for him. He needs to find out who is doing what they’re doing, and why. Learning the answers may not be enough. While reading THEY’RE WATCHING, I kept thinking of Cary Grant’s Roger Thornhill in North by Northwest, given that Roger and Patrick are both innocent men who are caught up in situations in which they each look extremely guilty. And indeed, there is a cinematic feel to the book, which demonstrates Hurwitz’s skills as a screenwriter. At the same time, he infuses Patrick’s first-person narrative with a southern California world-weary tone that in places puts one in the mind of John D.MacDonald’s Travis McGee series, a feeling that things may never get better. Hurwitz also keeps his complex plot tightly reined in and easy to follow all the way to the end, where the reason that very bad things have been happening to innocent people is tantalizingly revealed. THEY’RE WATCHING is a powerful work from a major talent who has yet to be fully and adequately appreciated.